much-anticipated and long overdue album, Change: The Lost Record, set for release on April 21. It was the first song he wrote in the house he bought in rural Nashville, but it transports you to Thompson’s Cedarburg, Wisconsin home through imagery so vivid that you can almost smell dinner on the stove in his parent’s kitchen. It is magical, it is country and it is real life. It’s a song that Josh’s late father would have liked. "I’ll say this," he begins. "As a songwriter, I’ve written every style of country music. What I like about country music is the honesty and the raw emotion. Whether writing about a childhood memory, a hard 40 hour work week, or a good drinking and leaving song, my music is how I express myself. Born to a hard-working Wisconsin concrete worker, country hit maker Josh Thompson changed his path from his blue-collar raising to destined country stardom when he picked up a guitar at the age of 21. Moving to Nashville in 2005, the singer-songwriter signed his first publishing deal just one month later and soon released his debut album, Way Out Here. 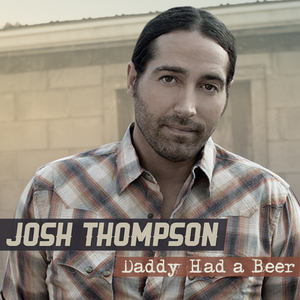 With his first two singles, "Beer on the Table" and "Way Out Here," grossing almost one million downloads, Thompson’s songs have since been cut by Brad Paisley, Tim McGraw, Gary Allan, Darius Rucker, Justin Moore, and Joe Nichols. He most recently gained attention for co-writing Jason Aldean’s recent #1 hit single, "Any Ol’ Bar Stool."